Armed with that philosophy, three aircraft, five destinations and 220 friendly WestJetters, we began our journey � a journey that would help us become a company of more than 8,800 passionate WestJetters flying one of the youngest fleets of Boeing 737 Next-Generation aircraft to more than 80 destinations in North America, Central America and the Caribbean. Our continued efforts toward responsible growthconsider our impact to the environment, to the communities where we fly and to and the people we reach on a daily basis. CALGARY, Canada - WestJet today announced it is extending two of its new non-stop transatlantic services to London (Gatwick) from seasonal to year-round. Flights from Calgary and Toronto to London will now operate on a year-round basis, three times weekly and daily respectively through the winter, while service from Vancouver, Edmonton, Winnipeg and St. John's will operate seasonally as announced in September 2015. "Today's announcement is another important step in the international expansion of WestJet," said Chris Avery, WestJet Vice-President, Network Planning, Alliances and Corporate Development. "Year-round service to and from Europe on board our fleet of Boeing 767-300 extended-range aircraft offers our business and leisure guests the opportunity to take advantage of our low fares, high value and remarkable guest experience on both sides of the Atlantic whenever it suits their schedule." CALGARY, April 15, 2013 /CNW/ - WestJet announced today it will begin code-sharing on American Airlines flights to 16 new cities beyond Dallas-Fort Worth in conjunction with WestJet's new, non-stop service between Calgary and Dallas-Fort Worth launching April 29, 2013. WestJet and American Airlines together will provide three round-trip flights per day between the two cities. The WestJet code has now been added on American Airlines-operated routes connecting through Dallas-Fort Worth to Albuquerque, N.M., Austin, Texas, Nashville, Tenn., Charlotte, N.C., Fort Lauderdale, Fla., Jacksonville, Fla., Kansas City, Mo., Orlando, Fla., Miami, Fla., New Orleans, La., Oklahoma City, Okla., Raleigh-Durham, N.C., San Antonio, Texas, St. Louis, Mo., Tampa Bay, Fla., and Tulsa, Okla.
"Our airline partnership strategy continues to grow, offering guests additional opportunities to connect throughout WestJet's world and beyond," said Chris Avery, Vice-President, Network Planning, Alliances and Corporate Development. "The addition of 16 new cities beyond Dallas-Fort Worth greatly increases connectivity for both WestJet and American Airlines guests, opening new markets for business travellers in particular." Two new destinations out of Chicago will also be available via the American Airlines partnership. Flights out of Chicago to Charlotte, N.C., and Fort Myers, Fla., will also operate under the code-share agreement. 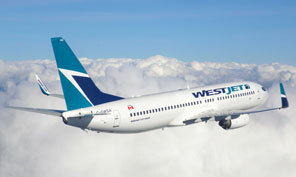 Check out the Destination guides on WestJet.com for great overviews, photos and information on these new destinations. With airline partnerships and upcoming launch of WestJet Encore, WestJet's network from Calgary International Airport continues to grow and offer travellers more non-stop flights and greater connectivity to more cities than ever before. With the addition of 16 new cities beyond Dallas-Fort Worth, WestJet guests departing from Calgary International Airport can now fly to a total of 50 unique destinations in the United States via our code-share agreement with American Airlines. Also as part of WestJet's agreement with American Airlines, members of WestJet Rewards can earn WestJet dollars on flights operated by American Airlines and its affiliates, American Eagle and AmericanConnection. The agreement provides WestJet Rewards members with the ability to accumulate WestJet dollars faster, especially those guests flying within American's extensive worldwide network of destinations, including North America, the Caribbean, Latin America, Europe and the Pacific. Members can book flights directly with American Airlines or through their preferred travel agent and earn WestJet dollars when they add their WestJet Rewards identification number to the booking. About WestJet WestJet is Canada's most preferred airline, offering scheduled service to 85 destinations in North America, Central America and the Caribbean. Powered by an award-winning culture of care, WestJet pioneered low-cost flying in Canada. Recognized nationally as a top employer, WestJet now has more than 9,000 WestJetters across Canada. Operating a fleet of more than 100 Boeing Next-Generation 737 and Bombardier Q400 NextGen aircraft, WestJet strives to be one of the five most successful international airlines in the world. DFW AIRPORT, Texas - WestJet Airlines, one of Canada's leading carriers, today announced it would begin nonstop daily service between Dallas/Fort Worth International Airport (DFW) and Calgary International Airport (YYC). WestJet will begin daily flights on April 29th, with seasonal service through the spring and summer months. The arrival of WestJet gives DFW its seventh new passenger airline in just over the past two years, and continues DFW's unprecedented run of success in adding new air service for the Dallas/Fort Worth community. "We're pleased and proud to bring WestJet Airlines to the Dallas/Fort Worth market," said Jeff Fegan, CEO of DFW International Airport. "WestJet's low fares and increasing popularity in Canada and throughout North America made them an obvious fit for DFW, and we think they offer our passengers outstanding connectivity to Canada and the Pacific Northwest." "Our non-stop daily service to DFW is a great fit for both DFW and WestJet," said Gregg Saretsky, President and CEO, WestJet. "There is a strong connection between these two western markets, stemming in part from the business ties within the energy sectors of both countries. We look forward to introducing Texans to our low fares, high value and great guest experience, as well as a host of new amenities coming soon which are designed to enhance the overall business travel experience." Launched in 1996 with three planes, WestJet is now Canada's second largest carrier, providing service to 83 destinations in Canada, the United States, Mexico and the Caribbean. WestJet utilizes a fleet comprised entirely of Boeing Next-Generation 737 aircraft, specifically 737-600s, 737-700s and 737-800s. WestJet currently has codeshare agreements with eight airlines, including oneworld alliance members American Airlines, British Airways, Cathay Pacific and Japan Air Lines. A Canadian low-cost carrier based in Calgary, Alberta, that flies to most major cities in Canada and 11 cities in the United States. WestJet is the second-largest Canadian carrier behind Air Canada (or third-largest if you count Air Canada Jazz). WestJet is a rarity in the airline industry due to the fact that it is non-unionized. Profit-sharing is credited for this fact. WestJet plans to be one of the world's top 5 most profitable international airlines, by 2016.. WestJet was rated the second-best low-cost airline in North America. Founded on February 29, 1996 by Clive Beddoe, Mark Hill, Tim Morgan, and Donald Bell, WestJet aimed to follow the same path as Southwest Airlines and Morris Air, as a low-cost carrier. Originally meant to be a western Canada operation, WestJet soon became one of the fastest growing airlines in the world. On February 29, 1996, the first WestJet flight (a Boeing 737) departed. At that time, the airline served Calgary (the airline's hub), Edmonton, Kelowna, Vancouver, and Winnipeg with a fleet of three Boeing 737-200 aircraft and two-hundred twenty employees. By the end of that same year, they had included Regina, Saskatoon, and Victoria. In 1997, service to Abbotsford was added. In addition, 1997 marked the one millionth passenger carried. In 1999, a milestone was reached when WestJet was able to offer its first public sharing at 2.5 million shares. Also in 1999, the cities of Thunder Bay, Grande Prairie, and Prince George were added to WestJet's route map. In 2000, the airline expanded to Canada's eastern region, reaching Hamilton, Moncton, and Ottawa, and choosing Hamilton as the airline's eastern region hub. That year, Beddoe, Hill, Morgan and Bell were given the Ernst & Young entrepreneur of the year award in Canada for their contribution to the Canadian airline industry. In 2001, expansion continued to include Fort McMurray and Comox, and to Sault Ste. Marie, Sudbury, Thompson and Brandon, although service to some of these cities was subsequently withdrawn. The airline's four creators also received another entrepreneurship award. 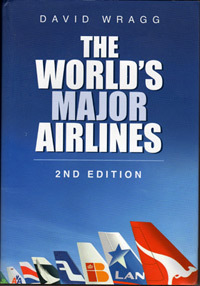 In 2002, the airline added two new eastern Canadian destinations: the cities of London and Toronto. In April 2003, WestJet added Windsor, Montreal, Halifax, St. John's, and Gander. In April 2004, WestJet moved its eastern hub from Hamilton to Toronto. All of the flights between Ottawa and Hamilton and Montreal and Hamilton were moved to Toronto, a move that brought WestJet more fully into the lucrative Toronto-Ottawa-Montreal triangle. In 2004, a number of U.S. destinations were added or announced. These included San Francisco, Los Angeles, Phoenix, Tampa, Fort Lauderdale, Orlando, and New York City. WestJet's transborder flights fly non-stop from Calgary (WestJet's main hub), as well as Edmonton, Kelowna, Montreal, Toronto, Vancouver, and Winnipeg. Palm Springs was added in early 2005 to the company's list of destinations, as was San Diego, while New York-LaGuardia was dropped. In April 2005, they announced new seasonal service to Charlottetown but ceasing service to Gander. In June 2005, the airline announced it was ceasing service to Windsor, effective October 30, 2005, shifting capacity to nearby London. In fall 2005, Ft. Myers and Las Vegas were added to the growing list of destinations. After rumours and speculation surrounding the implementation of extended-range twin-engine operations (ETOPS), WestJet announced new service to the Hawaiian Islands from Vancouver on September 20, 2005. In December 2005, the airline began flying from Vancouver to Honolulu and Vancouver to Maui. All flights returning from the Hawaiian Islands are overnight flights (red-eyes) allowing the carrier to reduce fleet downtime. In 2006, WestJet announced they were dropping their service to San Francisco and San Diego. WestJet's first scheduled service outside Canada and the United States began in 2006 with service to Nassau, Bahamas. This was considered a huge milestone within the company's long-term destination strategy and was a vital goal for future international market presence. In 2007, WestJet announced that they would begin flights from Deer Lake Regional Airport in Newfoundland, Saint John in New Brunswick, and Kitchener-Waterloo in Ontario. There would be direct flights to Toronto from Saint John, and Deer Lake, and flights to Calgary from Kitchener-Waterloo. Also in June 2007, WestJet added seven new international seasonal flights to Saint Lucia, Jamaica, the Dominican Republic, Mexico as well as a third Hawaiian destination; Kona. Those of us who boarded the inaugural flight of WestJet Airlines from Abbotsford Airport to Calgary, Edmonton and return and many others who packed the terminal area, find it heart- warming to see the partnership still blossoming and bearing fruit. The results justify the decision, which seemed so daring at the time and had the doubters snickering in their beards. Smelling success, we took the above photo to mark the occasion, as WestJet's President Clive Beddoe and Abbotsford Mayor George Ferguson addressed the overflow crowd assembled in a maintenance hangar, converted as a temporary passenger area. 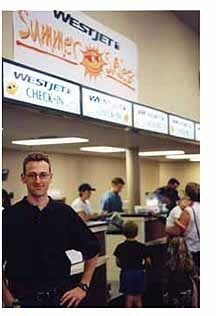 That was June, 1997, when WestJet Airlines launched the first commercially scheduled airline service to and from Abbotsford. To everyone's surprise, within three months, WestJet had increased its weekly flights from 11 to 20. The rest is history. The smile on Bryce Gibbs' face just keeps getting wider and wider these days. As WestJet Airlines' Abbotsford Manager, Mr. Gibbs and his airport operations and counter staff have many reasons for optimism, as their employer keeps on making news, and creating waves in the high-flying worlds of aviation and finance. For example, this May saw WestJet's overall traffic up by a remarkable 72.1% to reach 116,542,756, an increase in Revenue Passenger Miles (RPMs) of 72.1%. The airline's load factor rose to 75.3%, a jump of 4.7 percentage points from the previous May. Abbotsford Airport, which has enjoyed West Jet service since 1997, has experienced a major increase in the frequency of WestJet flights, and the passengers are applauding. This added growth will result in our passenger traffic topping the 200,000 mark by year end. It's been a landmark year. The reshuffling of players in Canada's Airline Industry has been a giant windfall for WestJet, which currently operates 16 Boeing 737 jet aircraft and serves 14 Canadian cities. Since our last edition of Wing Span Magazine, the Calgary-based airline has extended service to Hamilton International Airport, Greater Moncton Airport and Ottawa International Airport. For westerners, this means added traffic to and from key areas such as the highly populated Niagara Peninsula, Atlantic Canada and our Nation's Capital. More exciting news is expected, namely that Abbotsford/ Fraser Valley passengers will be able to fly WestJet to Montreal via Calgary before year end, pending airport negotiations. Commenting on these major steps forward, Stephen Smith, WestJet's President and Chief Executive Officer, said " Our total service has increased by 31% since March 2000, and we are continuing to build WestJet into Canadians' alternative for affordable travel this summer." For information on WestJet flights, destinations and fares, call 1-800-538-5696.